Hey all. I uploaded a photo of the wiring Id like to do. What im trying to avoid is running a bunch of wires to my battery and ignition sources. This is a long post, and the picture is kind of busy, but its not that bad. My GOAL is the run a positive wire from the battery to an on/off switch in the cab. There will be an inline fuse. I put 40amp in the picture but I can add more. Then from the switch back to a tool box. Im driving a chevy silverado. In the tool box will be a busbar. I will have 2 busbars. One will be position and one be negative. For the negative, I will run a wire from the battery back to the toolbox. In the tool box will run 2 compressors. My Goal was to run the compressors to the busbar and then use the on/off switch in cab. I can turn off the switch whenever I leave the vehicle. I would LOVE to run that switch off an ignition only power wire, but Im not sure of any that can handle the load of 2 compressors. So thats why I am just running in the inline on/off switch. Ok so now the confusing part. The Pressure switch I have is the blue 110psi/150psi horn blasters one. 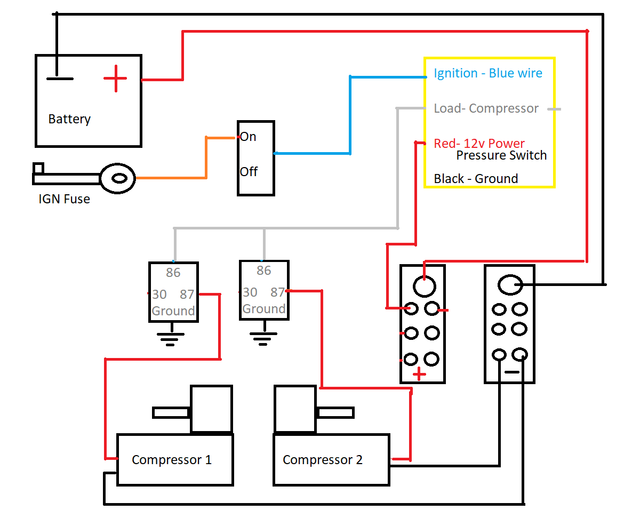 The wiring diagram shows the white wire runs to the compressor, the red is positive to the battery, blue goes to ignition and black is ground. IF I run the red, and blue wire to the busbar, and then run the white to the compressors, would that work? Therefore, I dont have to run wires back to the ignition. I also have an On/Off/On switch. 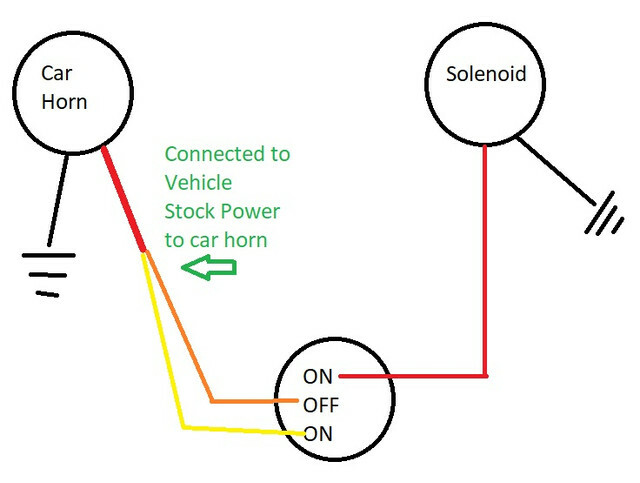 One side will be power to the solenoid to the airhorn and the other side will be normal stock vehicle horn. My questions is, ONE will this setup work? As in, just using the On/off Switch to control when everything turns on and off, and not run anything to the ignition. TWO, is there an ignition wire or fuse that anyone knows of that will run the busbar so I dont have to use the On/Off switch and just run everything off ignition only? THREE- Do I need any type of relays? 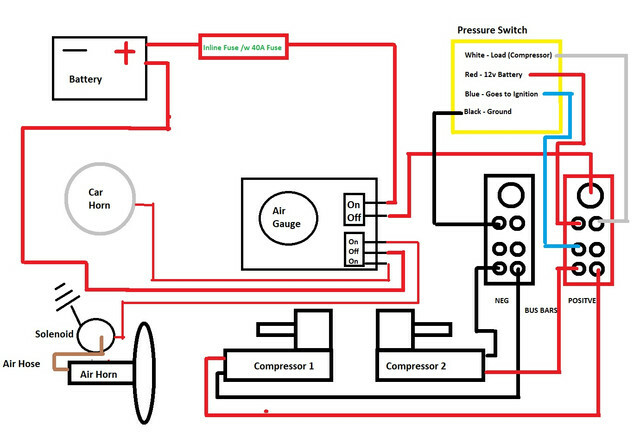 I found a wiring diagram on hornblasters website and they are saying to run relays for dual compressors. Is this something I have to do being so much amperage draw from the compressors. IF I use relays, can I wire the busbars to ignition only. I think this is everything. Hopefully yall can help. EDIT: I noticed in the picture I have the white (load) wire going to the busbar. This is incorrect. It would be connected to the compressors! Last edited by JMcGarva; 3rd February 2019 at 10:15 PM. Wire your toggle switch from a + Key on source to Pin 86 on the 100 amp relay and Ground pin 85. I would also Recommend That your second Compressor have its Own Relay. Hope this helps. 1998 Chevy Tahoe Ex Cal Fire Truck. Horns... Soon. 2010 Marin Bicycle w Torker Bicycle trailer, Grovers 1045 and 1042. 120 psi. Delco Remy Stock horns on Handlebars. TYC Alternator, York 210 (Both Pulleys turn with wheels. Centennial Car Battery for power. 2000 Honda Accord. Nathan Airchime K3HA, 7 Gallon tank, Vi-air 280-P and Vi-air 380-C, Denso 130 amp alternator from Junk yard Honda Odyssey. So this is what I got now. I have gauge dash panel that has a digital gauge, and On/Off Switch and a On/off/on switch. The On/off/on switch allows me to use the steering wheel to control the horn. One direction is the normal horn, the other direction is the airhorn. The On/off switch allows me to turn off the compressor if Im going down the road and ever need to shut it off.. If not, then it will shut off when I turn off the vehicle. Yeah, that second one is the way to go.